We had THE best raspberry cheesecake last month. 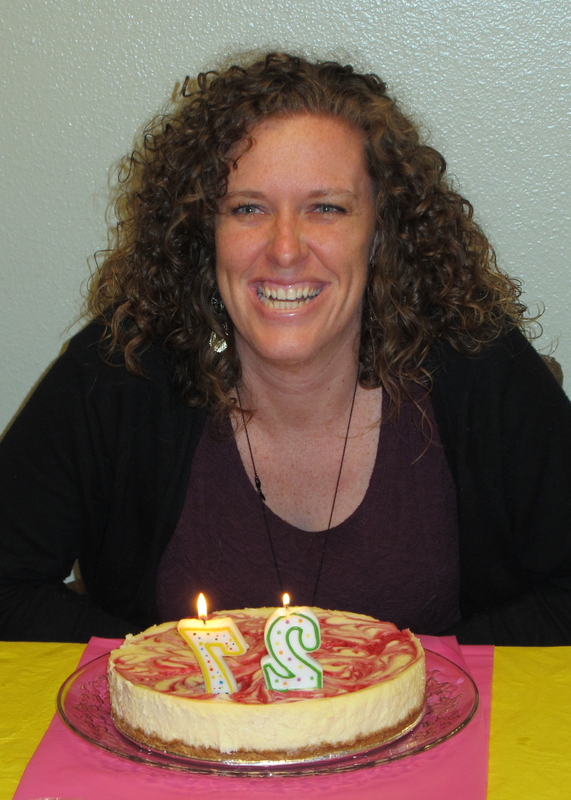 My daughter, Hilary requested a cheesecake for her birthday celebration. Yes, I still take special requests for cakes, etc. on the birthday persons special day. More importantly Hilary asked if the cheesecake could be swirled with a raspberry sauce. So being the dutiful mother that I am I went on an internet quest to find a great recipe that included raspberry sauce. 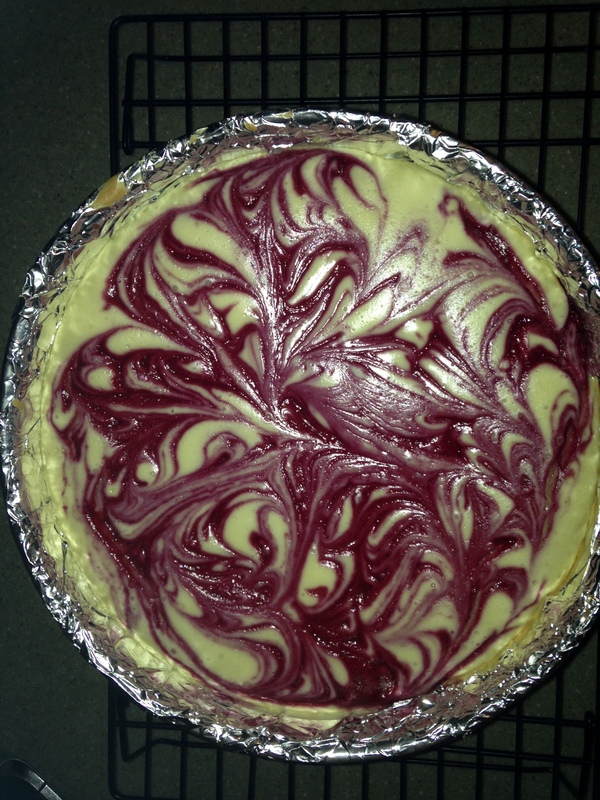 The recipe for the raspberry cheesecake that I chose is posted at Just a Pinch Recipes. This was the first time that I had made cheesecake with a homemade sauce to go along with it. The results were fantastic and there were raves and compliments all around the room. The cheesecake disappeared in a flash. If you want to try this cheesecake on your own here’s what you need to do. 1. Preheat oven to 350 F. Wrap exterior of a 9-inch springform pan (including base) in a double layer of foil; set aside. 2. Stir together cracker crumbs, melted butter, and 2 tablespoons sugar in a medium bowl. Press crumb mixture firmly onto bottom of pan. 3. Bake until set, about 10 minutes. Let cool in pan on a wire rack. Reduce oven temperature to 325 F.
4. While the crust is baking you can get started on your raspberry sauce. Process raspberries in a food processor until smooth, about 30 seconds. Pass puree through a fine sieve into a small bowl; discard solids. Whisk in 2 tablespoons sugar, and set aside. 5. Put the cream cheese in the bowl of an electric mixer fitted with the paddle attachment; mix on medium speed until fluffy, about 3 minutes. 6. With mixer on low-speed, add remaining 1-1/2 cups sugar in a slow, steady stream. Add salt and vanilla; mix until well combined. 7. Add eggs, one at a time, mixing each until just combined (do not over mix). Pour cream cheese filling over crust. 8. Drop raspberry sauce by the teaspoon on top. With a wooden skewer or toothpick, swirl sauce into filling. Keep swirling until you get a pattern/design that you are pleased with. 10. Transfer cake pan to rack; let cake cool completely. Refrigerate, uncovered, 6 hours or overnight. Before unmolding, run a knife around edge of cake. This recipe makes (1) 9-inch round cheesecake. You can garnish with fresh raspberries around the top of the cake if you like. If you’ve never made a homemade cheesecake this recipe can seem a little daunting at first. But just get busy and have fun making a delicious dessert. My birthday girl was extremely happy with the results, and I’m sure this cheesecake will make an appearance at one of our family parties again very soon. What a lovely looking cheese cake. I hope your daughter enjoyed it. Belated Birthday Greetings to her! My daughter loved this cheesecake, she only wished she could have had more !! Maybe a mini cheesecake all to herself. Thanks for stopping by for a visit.